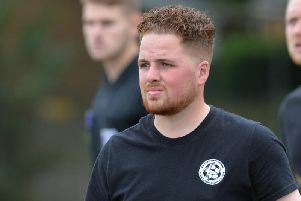 Harborough Town boss Nick Pollard has warned his players that big challenges lie ahead. The Bees have been flying in recent weeks as their form has seen them climb up the United Counties League Premier Division table and make progress in the FA Vase. This week alone has seen them knock Blaby & Whetstone out of the cup before picking up a fifth win in six league matches with a 2-0 success over Leicester Nirvana. But, according to Pollard, they need to be aware of sides wanting to shoot them down. “We’re getting to the stage where teams are going to start taking notice of us,” he explained. “It’s going to get harder for us to win matches, not easier. “You always raise your game when you take on sides at the top end and the more we win matches the more sides will look to knock us down. “We’re seven matches unbeaten now – and we’ve won six of those. “It would be easy for us to get carried away but we can’t allow that to happen. “Maybe over the last week we have taken our eyes off it a little bit and the players have been given a subtle reminder about what’s needed. “We took our foot off the gas a little against Nirvana in the first half and perhaps went into the Vase game against Blaby a little lightly because they are a level below us. “I’ve said to the lads that it is pointless beating Wisbech 4-1 and Eynesbury 4-1 if you then go and lose to a side like Nirvana who haven’t started so well. “It’s just a subtle little reminder that we can’t ahead of ourselves. “The good thing this season is that we have enough competition in our squad so the players know if they are not on form someone will have their shirt. That competition for places might get even harder as the manager is keen to add more options. He said: “I will probably be looking to bring in two or three players over the course of the next month. “We’re going well but you have to keep looking to get better and we’re probably more of an attractive prospect at the moment. Pollard did concede that, despite his slight misgivings about the last two displays, he was still delighted with the way things are going – especially as there is another test to come in the FA Vase. He added: “We’ve had two very good results in a week.